This 20-page booklet includes the guidelines for your challenge, planners to help you track and stick to the 30 day weight loss challenge and tools to help you when your willpower fades. Each person will have different goals and objectives which is why this booklet is totally customizable so that it works for YOU. Each page has various options to enable you to choose the best option for you. Go through each page below and print one of the options before moving on to the next page. Feel free to skip pages that you don’t think will be helpful to you. Put all of the pages together and file in a binder. Use one of our binder cover templates to create a fun binder cover. Each page will open in a new window so that the list of pages stays open on your screen until you print out all 20 pages (or those that you feel will help you). 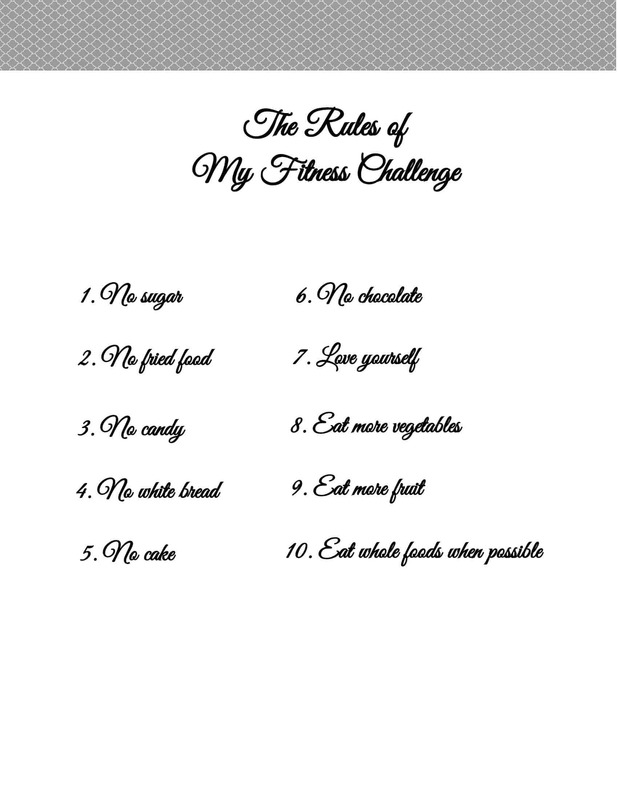 If you have any more 30 day weight loss challenge ideas then please leave a comment below. Decide on the guidelines for the next 30 days or for the next 7 days. 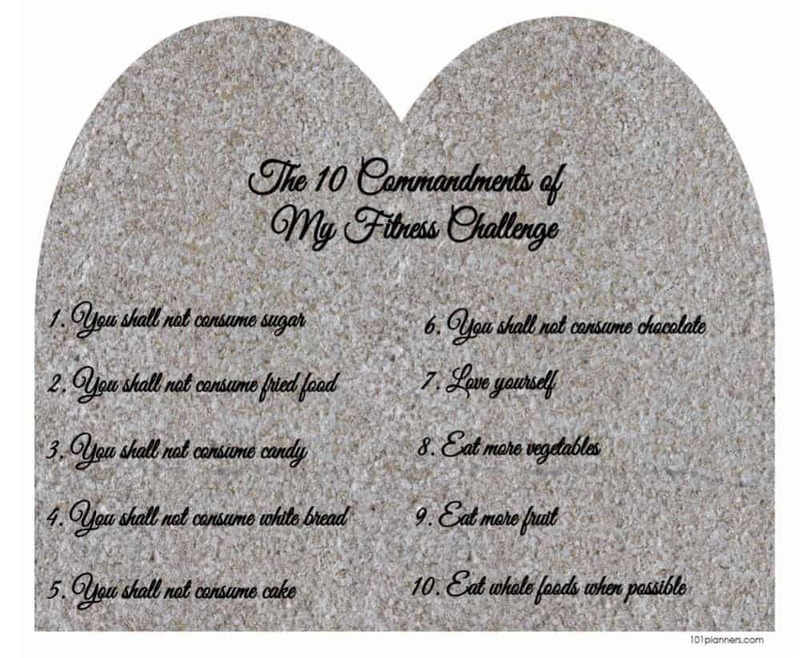 If you want to make gradual changes then set new rules each week (state which week each rule starts from). When I first did this challenge, I decided that I would go 30 days without sugar and from the second week I would give up white bread as well. The next time I did it I cut out white bread from day 1. Make rules that will work for you. There are two different designs – the 10 commandments or the 10 rules. 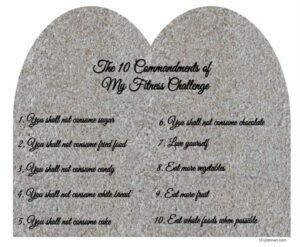 Before you print you can change any or all of the rules / commandments. You can also change the title if you want to personalize it. Open the promise to yourself and edit if you want to make any changes such as adding your name. Open the Commitment Contract and either type in your details before you print or fill out the printed form afterwards. Don’t forget to sign it as this is a binding agreement! 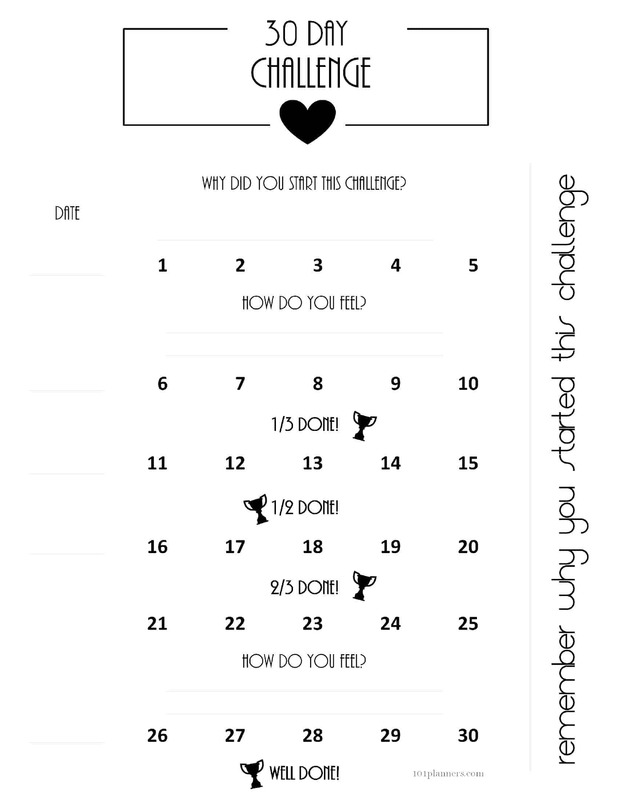 The following 30 day challenge countdowns will help you keep track of the 30 days and how many days are left until the end of the challenge. There is a generic 30 day challenge countdown (see below) and some specific ones for those who have specific goals such as a 30 day weight loss challenge, no sugar challenge, etc. 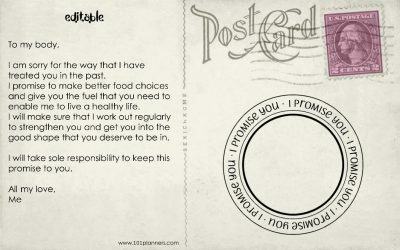 In order to start this 30-day challenge you need to ensure that have the healthy foods that you commit to eat at home. Choose the grocery list that best suits your needs from the list below. Make sure that you go shopping before you start if you are not stocked up with healthy foods for the first day at least. healthy grocery list, vegan grocery list and a vegetarian grocery list. 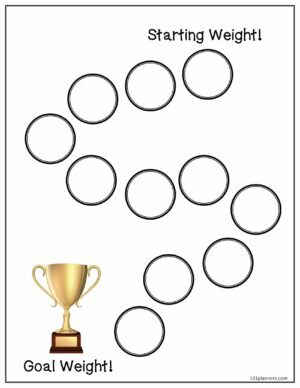 Write down your goal weight in the bottom circle. 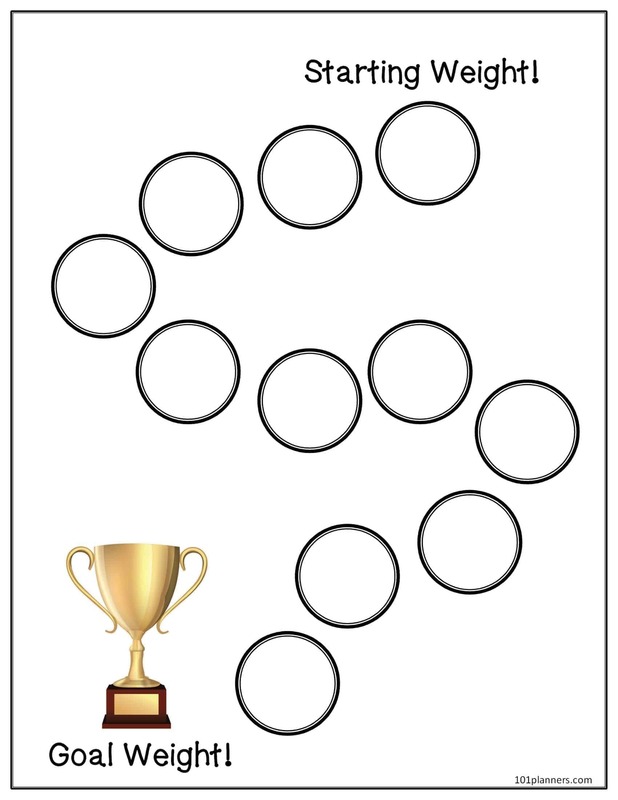 Write down your starting weight in the top circle. Subtract your goal weight from your starting weight and divide the result by 10. We will call this number the “outcome”. Add the “outcome” to the goal weight and write it in the circle above the goal weight. Add the outcome to the number that you reached in the previous step and write it in the circle above. Keep doing this until you fill all circles. Your tracker is now ready! If you used a goal that is realistic to reach within 30 days then mark each milestone as you reach it during the 30 day challenge. 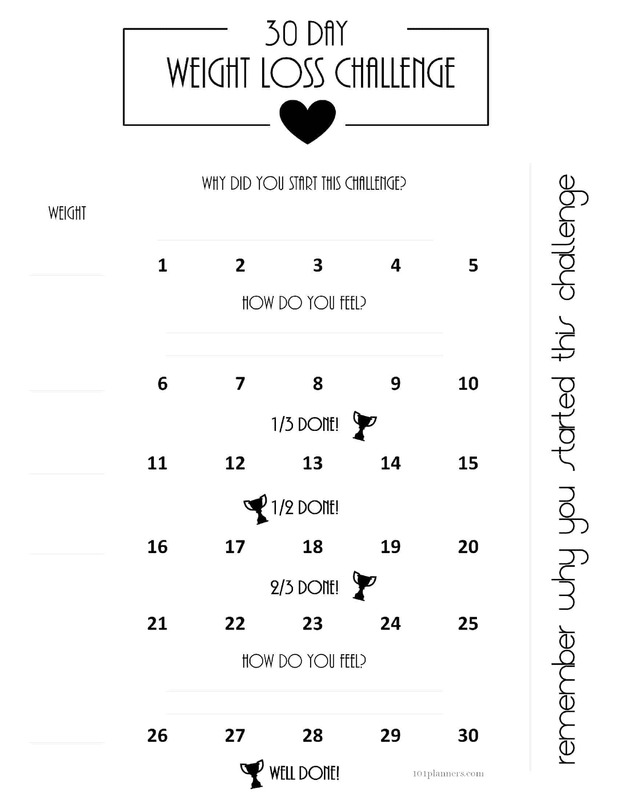 If you used a long term goal then keep using the tracker after the 30 day challenge. Do not weigh yourself more than once a week. The weight loss tracker will probably not be complete in 30 days but you can use it afterwards. This is a 30-day challenge but that isn’t really the goal. The goal is to get a taste of a new lifestyle that you can sustain forever. In order to do this we will need to change old habits with healthy new habits. 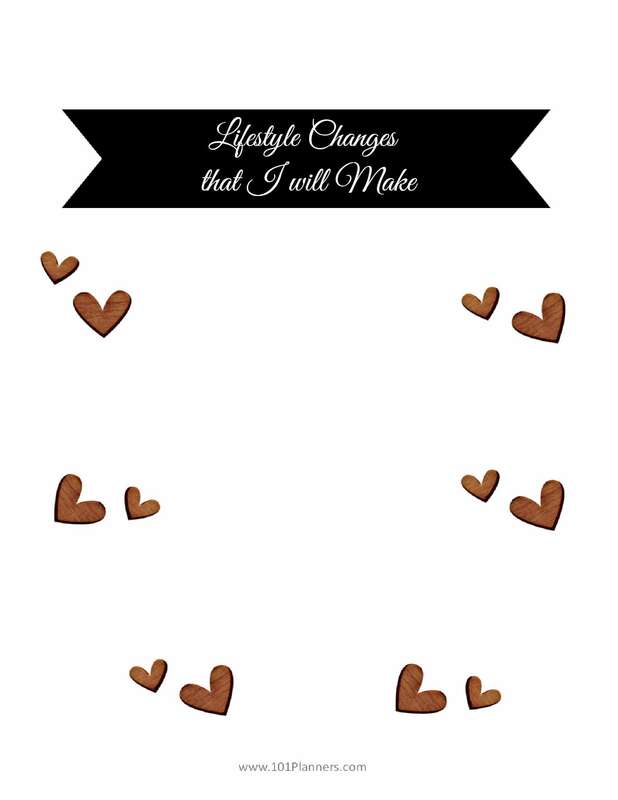 Remember, if you don’t make any changes then nothing will change! The goal is to change two bad habits with two new habits each week. Print a food log for week 1. One of the most difficult parts of a 30 day weight loss challenge is overcoming cravings for the things that you are not eating during your 30 day challenge. My goal for the challenge was to go without sugar for 30 days and there were times when my kids’ candy bars were tormenting me. I couldn’t stop thinking about them. The goal of this bucket list is to think of a few things that you will do during the 30 days to shift your focus on to other things that are not related to the cravings that you might have during your 30 day challenge. Here are some ideas from my bucket list (feel free to add my ideas to your list or to make up your own list): try 2 new fruits that I don’t usually eat, try 5 new vegetables that I don’t usually cook, make 2 new healthy recipes that I haven’t tried before, go snorkeling, play basketball with my kids (besides spending quality time with my kids it keeps me busy and burns calories but somehow I rarely take the time to do it), have a picnic dinner at the beach, buy one new product that I have never tried from a health store and use it, go ice skating with my kids. If you are looking for things to keep yourself busy during the 30 days then you can use this time to create a longer bucket list for the rest of your life. 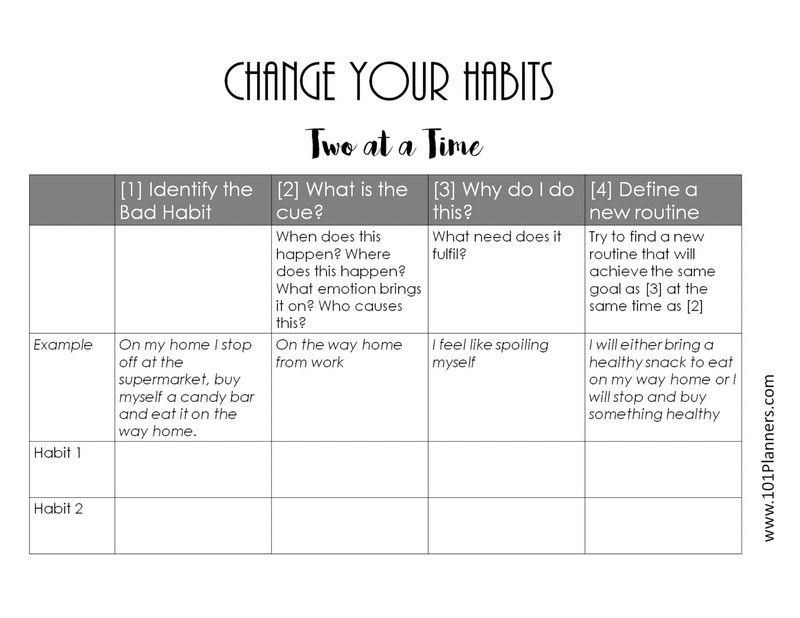 Print another worksheet for the second week to try and change two more bad habits. Print a food log for week 2. You can either make another copy of the same food log that you used for week one for choose another color/design for variation. There will be times when you want to stop the challenge because your willpower fades and you will consider starting “tomorrow”. A craving is a feeling that passes if we let it and don’t act on it. Use this list of things to take your mind off your craving when they hit. My list includes things like taking a bubble bath, manicure or pedicure, going to try on clothes at my favorite store, making a healthy smoothie, tidying my cupboard, watching a movie, going for a walk, calling a friend, experimenting with make up. Try to think of things that will make you feel better about yourself. Are you wondering if this is not the same as the bucket list that you prepared earlier? That list is for things that you want to get done even though you don’t usually do them. This list is for things that you know that you love doing but might not think of doing when a craving starts. For example, a bubble bath isn’t something that you would put on your bucket list but it will probably make you feel better until your craving passes. Here are some motivational quotes that you can print and insert into your binder. 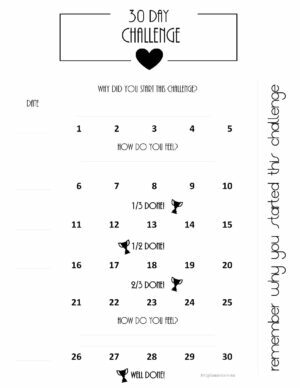 Print the ones that you like and put them in your binder to help keep you motivated. Print another worksheet for the third week to work on two more bad habits. Print a food log for week 3. You can either use the same food log template that you used for week 1 and 2 or mix and match. 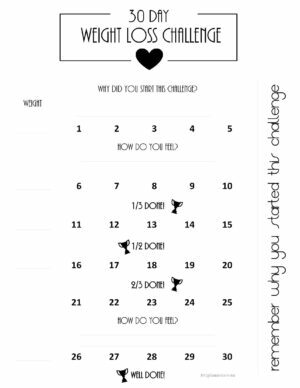 Print another worksheet for the fourth week to work on two more bad habits. Some people find that journaling helps them achieve their weight loss goals. Why not give it a try? Print a food log for week 4. You can either use the same food log that you printed previously or mix and match different colors. Print a food log for week 5. There are only two days left of the challenge this week but you have a full week on your food log in case you decide to continue with your new healthy lifestyle! Once you have completed this 30 day challenge you might want to turn the changes you made into your new lifestyle or adopt some of the changes that you found helpful. 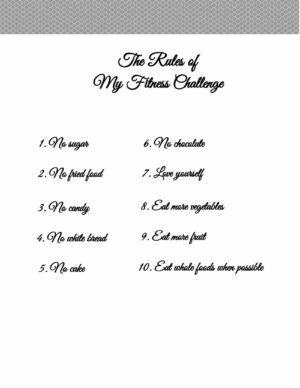 This list is blank so that you can decide during the 30 day challenge and at the end if you want any of the new rules to become guidelines for your lifestyle or part of your next 30 day challenge. Once you start working on this list take into account that the guidelines must be feasible. You will probably go through periods where you cannot or don’t want to live according to the new guidelines so make sure that one of the rules relates to what happens if you do fall off the wagon. For example, if you go on vacation and find that you are not be able to limit your food intake then make a rule to get back on track as soon as you get home.